Assuming that you’re not sculpting a modern gravel-based backyard, gardening is a relaxing pastime. Yet without the right tools it can be downright stressful. The garden hoe is a must-have tool for any gardener for performing important tasks such as weeding and (to an extent) tilling. However, when it comes to hoes, they are not all created equal. This short guide will help you understand the basic differences between them. If you already know your hoes from your trowels from your secateurs, then you can jump to the product reviews. 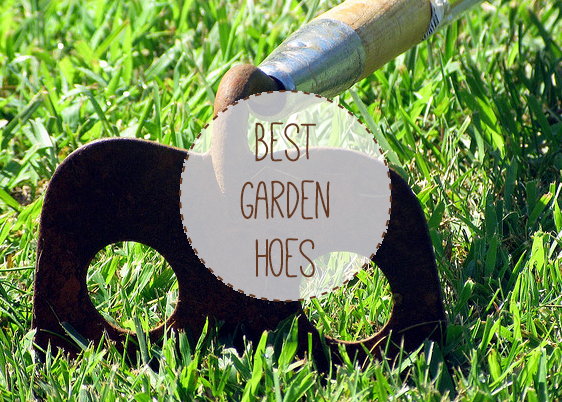 There are 4 basic types of garden hoes: push hoes, draw hoes, chopping hoes and scuffle hoes. Push Hoes: Push hoes thrust away from you when cutting, while draw hoes, such as an American pattern hoe, drag towards you when you cut. The most common type of push hoe found in the US is the six or seven inch-wide straight edge blade. Draw Hoes: Draw hoes are the best-known type of garden hoe, with the most common pattern being the aforementioned “American Pattern”. This pattern features a six inch wide by five deep rectangular blade that resembles a tombstone, and is suitable for a wide range of tasks. Draw hoes intended solely for weeding have very shallow, pitched-over blades to slice more easily, while draw hoes such as the “Southern Meadow” or “Blackland” are wider, lower-draw hoes that are intended for use on rural land. Chopping Hoes: Chopping hoes are more commonly found in Asia, Africa and Europe. These tools have uncommonly thick, upright blades intended for shallow ground breaking and intense weeding. The most efficient ones have an outward curve to the blade. Scuffle Hoes: Scuffle hoes cut both on the pull and the push, which makes them the most efficient garden hoes. 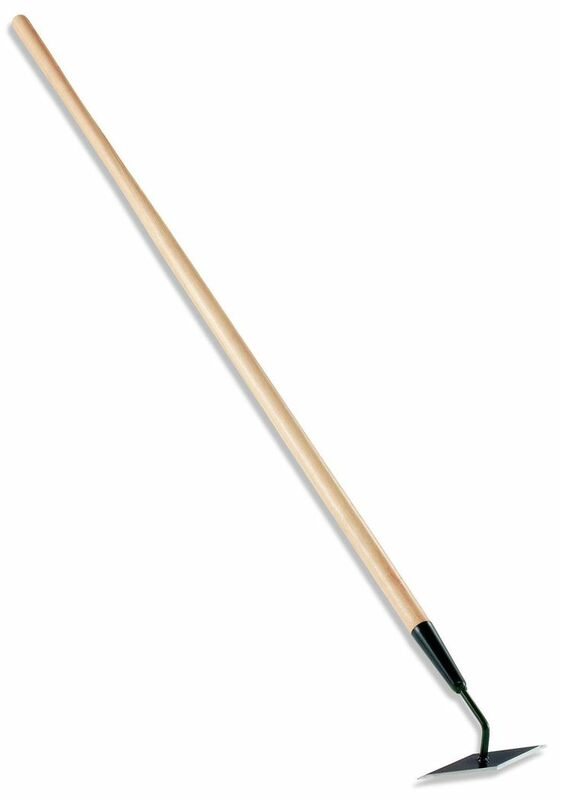 The most common type of scuffle is the oscillating hoe, also known as the Hula Hoe. It’s essentially new and improved version of its ancestor, the stirrup. The stirrup hoe was designed so that the user had to slightly angle it down on on both the forward and backward strokes. The scuffle hoe was later redesigned with hinges so that it oscillates, automatically cutting on both the forward and backward stroke. There are a variety of hoes, and each kind is designed to perform a slightly different function. There are hoes for raised beds, hoes for making furrows, hoes for narrow spaces, hoes that work as cultivators and hoes for performing farm work. Check out these reviews to find the perfect tool for your next project! This tool does it all! The heat treated, self sharpening blade works below the soil, which has an aerating effect whilst also effortlessly cutting weeds at the roots – if you’re so inclined you can leave them to create a nutrient-rich mulch. The smooth, sturdy 54″ handle and effortless performance eliminates back strain, which is perfect for those with back problems. The Hula-Ho is made in USA and includes 1 replacement blade. Are you looking to do some serious digging? The Rogue Garden Hoe has been named the ‘dirt digging machine.’ The 5.75 inch wide, high grade tempered steel blade is precision sharpened on all 3 sides for effortlessly bursting open new ground and turning over soil. It cuts at all angles and never needs sharpening, while its distinctive shape allows it to easily fit between plants. 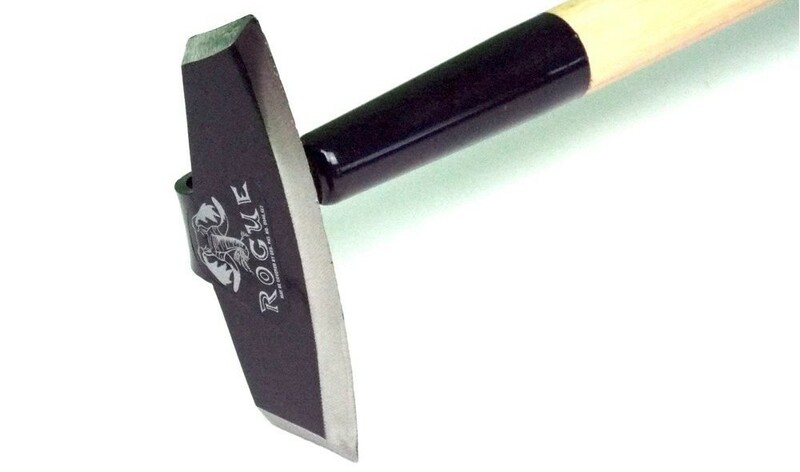 The Rogue Hoe is perfectly balanced, so it can be used by both men and women. Definitely a piece that won’t need replacing. 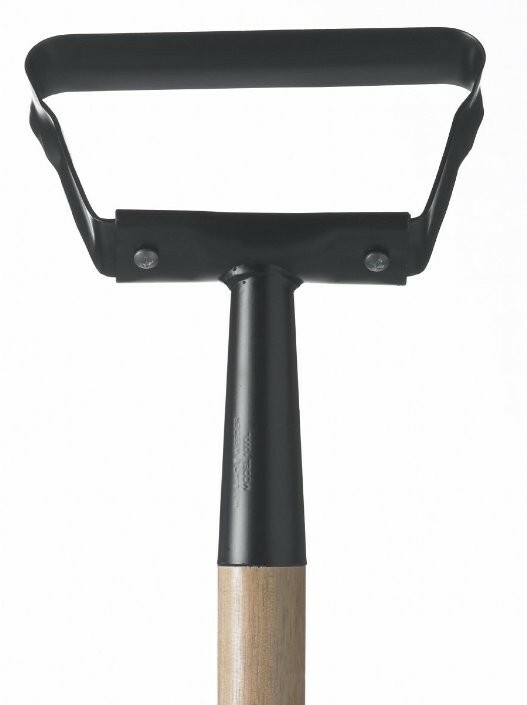 This weeder features a triangular shaped head, which makes it the perfect tool for creating furrows and cultivating soil in between plants. The ears on the back of the head can be used to pull back the soil to plant new seeds. It features a 4-3/4 inch by 6-5/8 sturdy blade with a 54″ North American ash handle, and it’s backed by a 5 year warranty. This is the perfect tool for preparing your beds for a variety of crops. 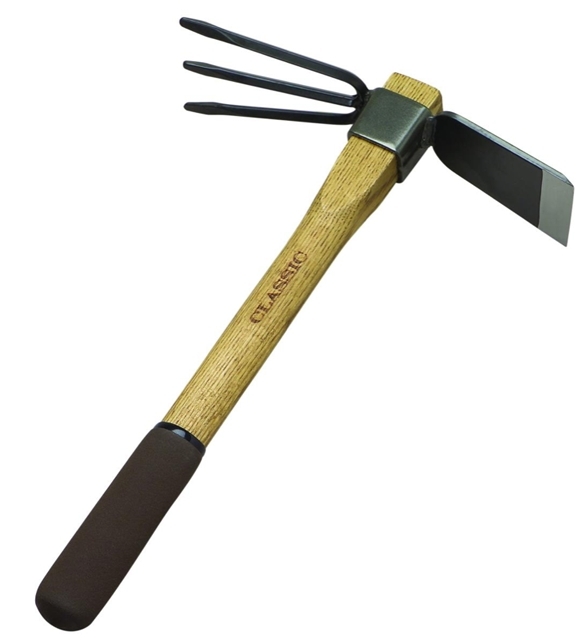 This top-rated hoe features a very sharp, carbon steel diamond shaped blade that cuts weeds on both pull and push strokes. The points of the blade are magnificent for weeding in hard to reach areas, such as in wide raised beds or between perennial plants. Kept just below the surface of the soil, it can weed without turning weed seedlings to the surface. It is also a great tool for loosening soil. Looks great doesn’t it? This much-loved hand tool is modelled after a traditional design and is just great for those who enjoy getting up close and personal with Mother Earth. The Flexrake Classic Tiller features an oak handle and a carbon steel blade to ensure it lasts. This is a great tool for weeding, digging and planting. The size of your space will determine the type of tool you need. For example, smaller yards with tight spaces between plants will require a smaller hoe, while larger areas will require a wider one. Lighter hoes are great for eliminating newer weeds, but tougher weeds will require a sturdier tool. At the same time, harder soils require a more durable hoe (carbon steel, for instance), while softer soil can be worked with a lighter one. To eliminate back strain, select a hoe that is as tall or taller than you. Select a hoe that is appropriate to your strength and fitness level. Lighter is (usually) better. If you click on the images you’ll be taken to our partner sites. Great post, I haven’t heard about the Flexrake 1000L. Must give it a try next time. Right now I am using Bully Tools 92354 in my garden. Hey Zac, thanks! Bully tools look great!